The Globe Inn01328 710206work RestaurantThe Globe Inn is situated overlooking a picturesque, leafy Georgian square and is a short stroll from the bustling quay of Wells-next-the-Sea. 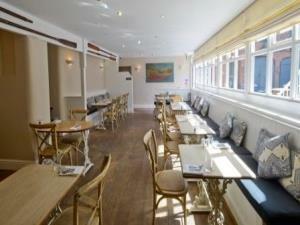 It has a warm, welcoming bar and comfortable restaurant with a sunny courtyard for alfresco eating and drinking. In early summer, enjoy the tenderest asparagus and sweet early strawberries, the first sea bass of the year, spring lamb and vegetables, then tasty crab, samphire and the freshest mackerel straight out of the sea. While in autumn, we offer sea trout and local mussels. As autumn turns to winter, take comfort in warming winter food of wild game from Holkham Estate, roasted winter root vegetables and jugs of richly stocked gravy. Our menu is traditional modern British pub- food that reflects the area our young chefs live and work in. The Globe's kitchen also caters for little appetites, making home-made dishes such as little fish and chips and baked pasta. Any special dietary requirements can be accommodated given some notice. We have a small dining room available for private parties up to 20. From 1st November, The Globe will be serving delicious breakfasts and morning coffee from 9am until 11am. Choose from a selection of hot breakfasts or from our continental buffet. The Globe Inn is situated overlooking a picturesque, leafy Georgian square and is a short stroll from the bustling quay of Wells-next-the-Sea. It has a warm, welcoming bar and comfortable restaurant with a sunny courtyard for alfresco eating and drinking. The Globe also offers a Sunday roast and often runs themed menu nights. For more information please visit our website. Monday to Saturday 11am* - 11pm. *9am from 1 November 2009.